Last-gen AC4 meets Wii U, PC, PS4 and Xbox One versions in a mammoth six-format comparison. Assassin's Creed 4: Black Flag may not promote itself as a "built from the ground up" next generation experience, but Ubisoft's in-house AnvilNext engine is designed to scale up and take advantage of the latest graphics technology, and plenty of visual upgrades and performance improvements are promised for PC, Xbox One and PlayStation 4 owners. But just how big of a leap are we actually witnessing? And is the difference worth paying a premium for over the current generation editions of the game? Finally, with all six versions of Assassin's Creed 4 on the table, we can put these issues to the test with the definitive look at Ubisoft's epic open-world swashbuckler. To recap, the 360 and PS3 versions of the game offered up essentialy an identical visual presentation, with matching art and a native 720p framebuffer, with the Xbox 360 version closer to reaching the desired 30fps update, in turn delivering smoother gameplay with better controller response. 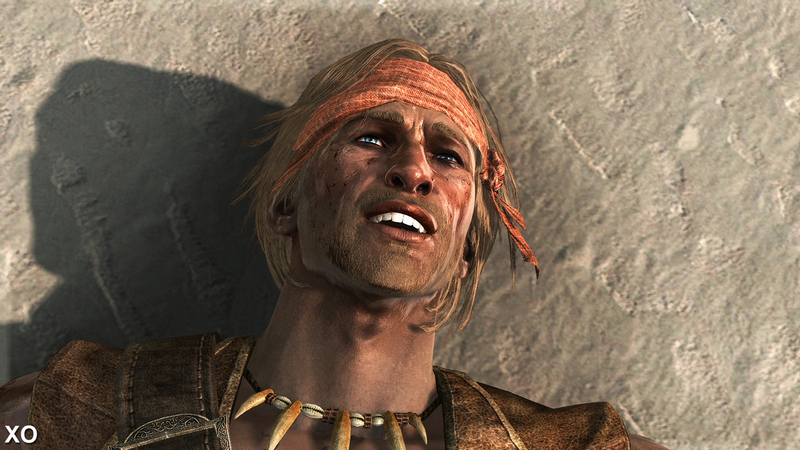 But it's safe to say that choosing between PS3 and 360 is something of a Hobson's choice. There is a real sense that the game is held back by the constraints of last-gen console hardware, with the potential for both Sony and Microsoft's new consoles to finally deliver a smooth experience where the action isn't compromised by a lack of system resources. There's also the Wii U version to address too. Last year's offering didn't quite match up to the existing PlayStation 3 and Xbox 360 versions, but it was a solid effort on a technically ambitious game and one of the few multi-platform success stories of the launch period. One year later, is there any improvement? Is there any sign at all that the more modern Nintendo architecture can offer up an experience above and beyond the impressive, if performance-challenged last-gen versions? A vast raft of comparisons is set to follow, beginning with something of a first - a colossal hex-format comparison gallery, encompassing every version of the game. 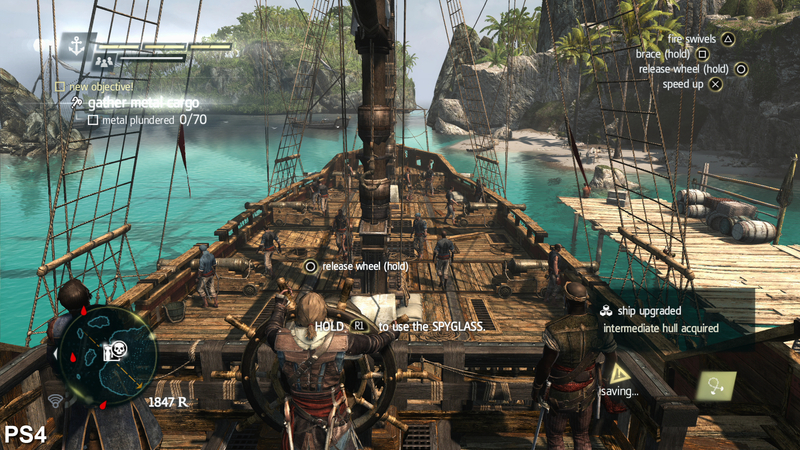 In terms of video, let's kick off with the flagship next-gen console versions of Black Flag. Regular readers may recall that our initial impressions of the launch PS4 code were very positive: rendering with a 1600x900 framebuffer we saw the stock retail code maintain a solid 30fps throughout the initial time we spent with the game. The situation improved still further when Ubisoft released a post-release patch delivering a clear 44 per cent boost to resolution without any noticeable performance penalty, offering up a slick, highly appealing full 1080p presentation. An over-sharpened 900p takes on native full HD as we compare the Xbox One version of Assassin's Creed 4 with its PlayStation 4 equivalent. Use the 1080p option and full-screen playback for the best experience. So once the day one patch has been applied we're looking at a crisp, native 1080p framebuffer on the PS4, backed up by a new custom post-process anti-aliasing solution that works well in suppressing jaggies across much of the scene. This gives the game a clean look overall, barring issues with sub-pixel detail that can only be resolved on PC, where a vast range of anti-aliasing options are available if you have the GPU power to run them. Moving onto Microsoft's console, there's no special update to boost resolution on the Xbox One game, which renders at 1600x900 while using an older post-process AA algorithm that doesn't provide the same smooth level of coverage we see on PS4. This isn't necessarily a deal breaker though, if you consider how well the stock 900p PS4 game is upscaled - even without the patch, overall image quality still looked remarkably smooth. That said, it's instantly obvious that the same level of image quality isn't present on the Xbox One release, which looks visibly worse in comparison to the unpatched 900p PS4 game. Essentially this translates to a fuzzier image on screen that highlights the breaking up of fine detail in the distance while smoothing over texture details. As we've seen in other sub-1080p games upscaled by the Xbox One hardware, overall image quality is further impacted by the introduction of an unwanted sharpening filter, directly responsible for the grainy pop that surrounds the texture work and foliage throughout the game and the visibly hard edges on foliage and complex scenery. The comparison in image quality is striking: The 900p framebuffer and sharpening filter result in broken sub-pixel details on the Xbox One compared to the PS4 game. The PC delivers the cleanest presentation using 4x MSAA, though 8x is available if your GPU can handle the extreme load. For the most part the core artwork is a match between PC, PS4 and Xbox One, although details appear blurrier on Microsoft's console due to the upscale taking place. 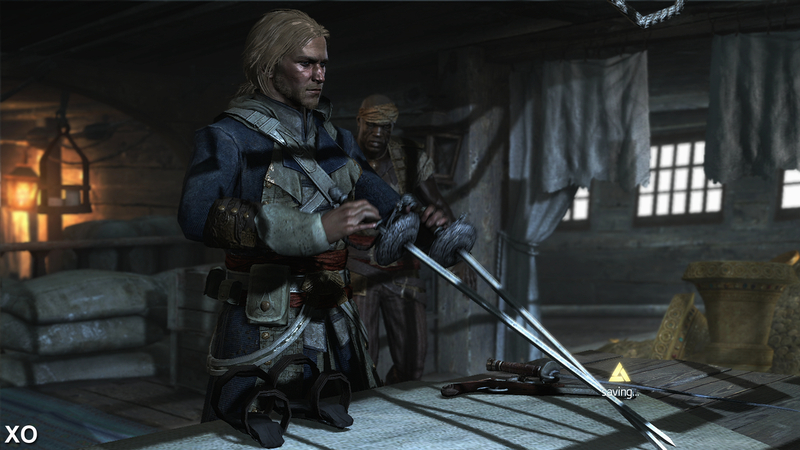 Lower resolution textures are also present occasionally on the Xbox One version, seen here in an early cut-scene on the characters clothing. The upgrade in texture quality is considerable moving from the last-gen versions of Black Flag to the PS4, Xbox One, and PC releases, with far more intricate detail displayed on character's skin and other surfaces with high frequency information. Draw distances are improved on the next-gen formats and PC. Extra details appear further away from the player and there is less noticeable pop-up on screen, although this sadly isn't completely eliminated, particularly with regards to shadows frequently fading in. 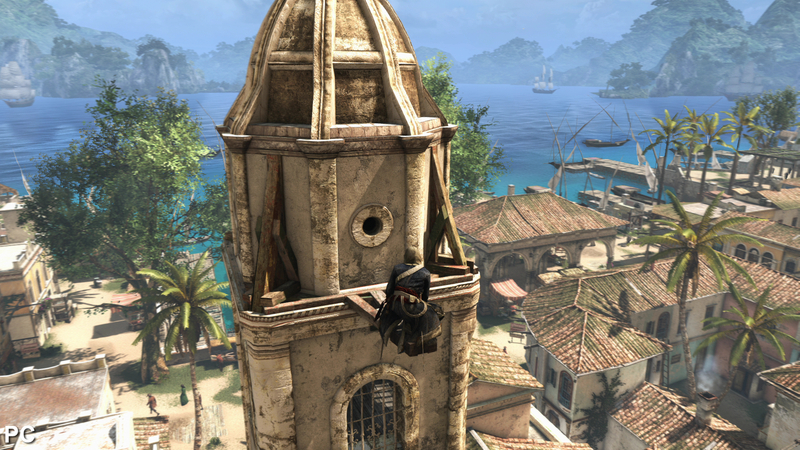 The boost in detail is clear when switching to the next-gen versions of Black Flag. Environments feature more foliage and objects on the ground that help to more realistically populate the many beautiful locations on offer. It's disappointing that the Xbox One code is impacted in this way, especially when you consider that Ubisoft has managed to achieve parity between the two consoles in a great many areas. 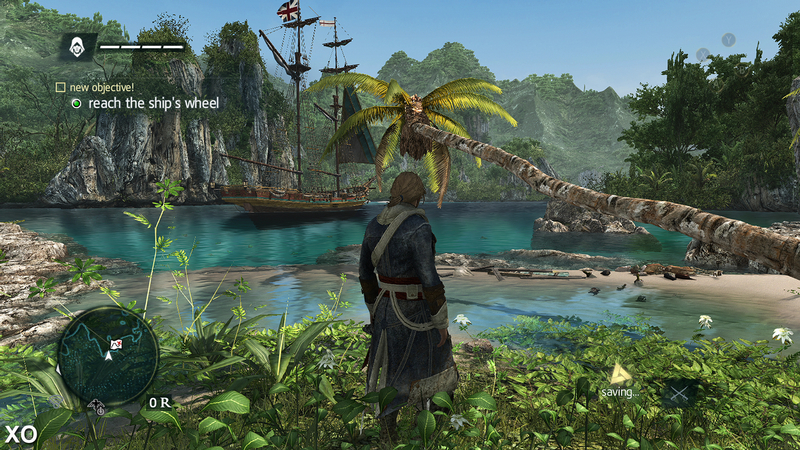 Barring the occasional use of a few lower resolution textures on Microsoft's system in the odd scene, the artwork is comparable between both next-gen consoles. Meanwhile, lighting and general effects work throughout the game are a match across both platforms. What differences we do see often comes down to the dynamic nature of the game's weather and time of day systems, which adjust these variables on the fly. 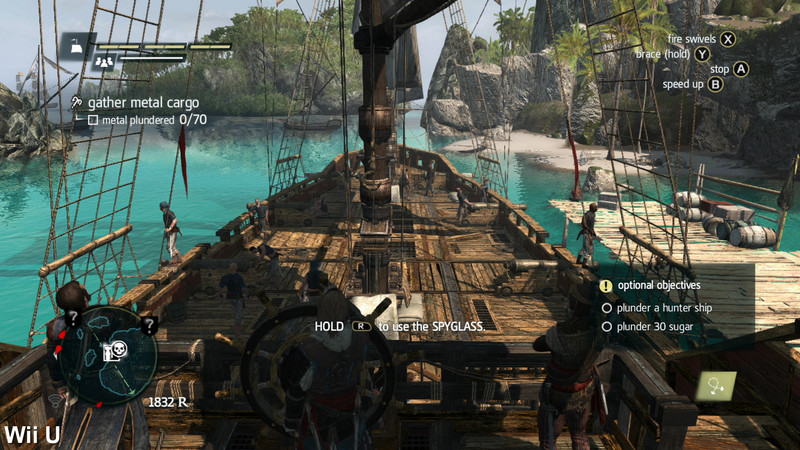 The PC version provides a similar visual experience to the PS4 release, but with the ability to achieve better image quality over the consoles. The main improvement comes with the inclusion of horizon-based ambient occlusion (HBAO+ in this case), resulting in more defined indirect shadows compared to the simpler SSAO-style effect we see in place on PS4 and Xbox One. Most welcome of all is the ability to select from a wide range of anti-aliasing modes - most notably MSAA, FXAA, and SMAA. We opted for 4x multi-sampling for a reasonable balance between image quality and performance, providing an instantly noticeable visual boost over the next-gen consoles. Other than that, we are looking a close alignment between Xbox One, PS4 and PC, which stand apart from the PS3, Xbox 360 and - yes - the Wii U versions. So the question is, what does the next-gen difference actually translate into? How much of an upgrade are we looking at over and above an increase in resolution? 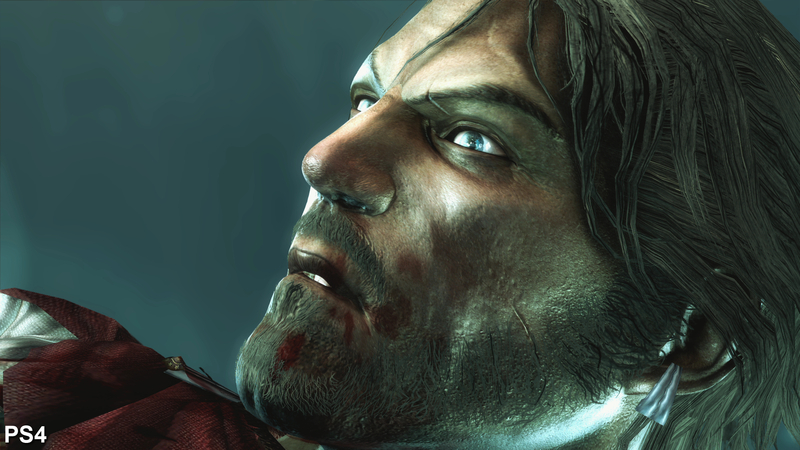 As expected, texture detail and environment complexity is increased over the last-gen versions, with fine details and subtle facial features appearing more prominently on the characters. Streaming is better handled too, with fewer objects popping up on screen as you approach them - although this issue isn't entirely eliminated. 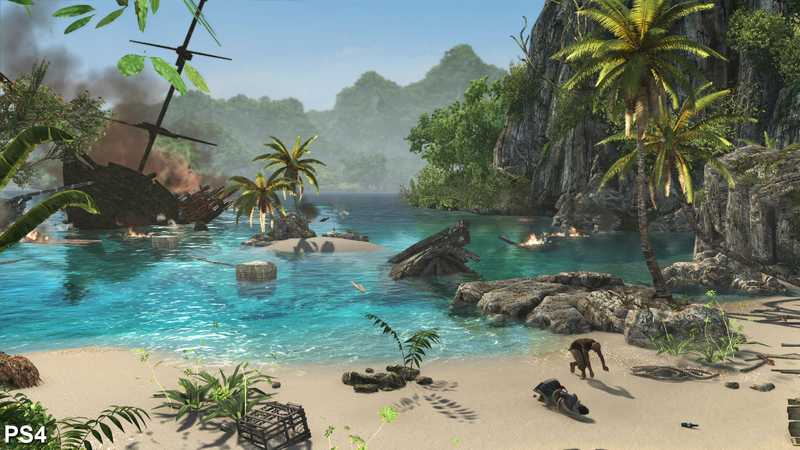 Elsewhere, the visual effects work is also expanded upon with the inclusion of more advanced surface shaders, soft shadows, and with impressive interactive foliage that dynamically reacts to characters. A subtle object blur implementation is present on the PC and next gen formats, although the effect is used subtly throughout the game, adding a mild cinematic touch to the presentation. Environments and characters are illuminated more realistically on the next-gen and PC versions of Black Flag, with additional lights and shadows lending additional depth and a more natural feel to various scenes. Soft shadows on the PS4, Xbox One, and PC replace the fuzzy lower resolution alternatives found on the last-gen consoles. The PS4, XO and PC versions of Black Flag feature a more complex water simulation than the last-gen games, featuring additional surface shaders and more pleasing reflections. 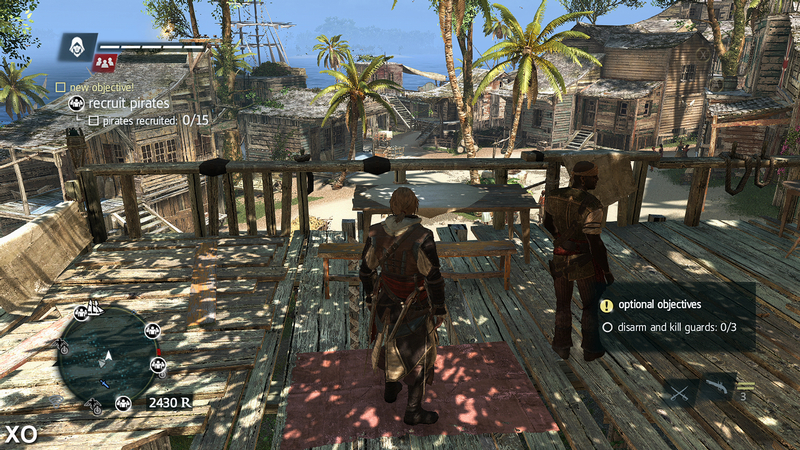 The PS4 and Xbox One versions of Black Flag appear to use the superior horizon-based ambient occlusion over the simpler SSAO solution used on last-gen consoles, resulting in more defined indirect shadows. This effect is further enhanced on the PC, shown here using a higher end HBAO+ implementation. One of the most noticeable improvements comes with the huge increase in alpha and particle effects: large plumes of volumetric smoke cover the screen in naval battles after the various ships have fired their cannons. Stormy weather conditions feature more in the way of atmospheric effects, such as heavier raindrops and particles, along with a thicker layer of mist that obscures your view of the horizon. These changes better encapsulate the feeling of sailing across the unpredictable open ocean and engaging in heavy combat against large military battleships, where the expanded effects work transform these skirmishes into much more of a spectacular event compared to the last-gen versions. Those hoping for the Wii U version to slip somewhere in between the PS3/360 and PS4/XO experience are in for a disappointment though. Ubisoft has created a two-tier product and the Nintendo version is very definitely pegged at the lower level. Native 720p resolution is standard here, and the same in-house post-process anti-aliasing solution is also in effect, delivering similar results to Xbox 360 and PS3. In fact, the only points of difference revolve around slightly reduced texture filtering in some scenes, and a cooler overall colour balance that doesn't quite covey the warm glow of the tropical sun quite as well as the other platforms. Both of these things are small nitpicks though, not harming the overall presentation in any meaningful way. There is GamePad integration but it's nothing to write home about, amounting to a relocation of the map screen and the rather more welcome off-TV play. More alarming is that while multiplayer is included, DLC content won't be released on Wii U. Disappointing. "The Wii U version is an almost complete match for the Xbox 360 and PlayStation 3 versions of the game, with few enhancements over and above basic GamePad and Off-TV support." Here begins the most comprehensive range of Wii U comparisons you're ever likely to witness for any one game. Here we're kicking off with the best version vs. the weakest - PC vs. Wii U. In terms of the actual shipping product, while image quality is largely a match, performance is a genuine issue, providing an overall experience that comes across as distinctly sub-par when compared against the last-gen releases, let alone the vastly superior PS4 and Xbox One versions. The Wii U version consistently falls 6-10fps behind the 360 and PS3 releases, resulting in a jerky, often uneven update and a profound, unsatisfying reduction in controller response. 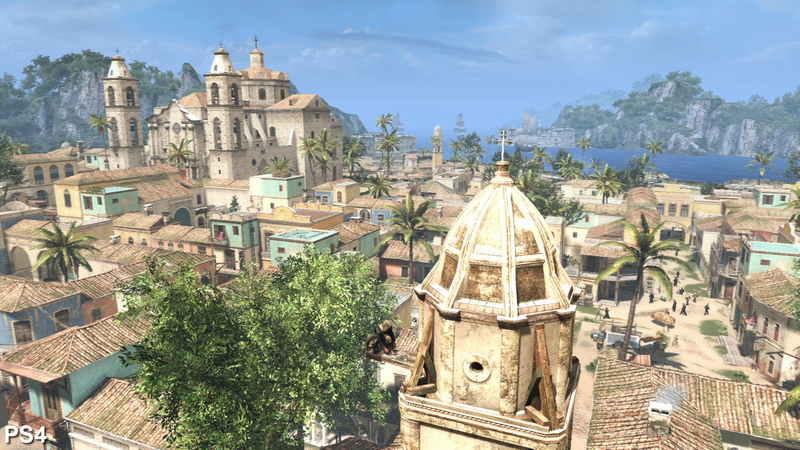 Combined with the GamePad's twitchy analogue sticks, the low frame-rate makes frantically running across rooftops and chasing down targets a frustrating affair, the net result being that we'd often have to repeat some missions multiple times - something that wasn't much of a problem on 360, and with no issues at all when playing at 60fps on the PC version of the game. Thankfully, the performance situation is far more positive when sampling both next generation consoles. While we aren't looking at the 60fps gold standard favoured by enthusiast PC gamers, Black Flag manages to stick closely to a solid 30fps across both formats. In fact, on the PS4 we never felt or noticed anything other than a locked 30fps update at all during our four hours or so of capturing - an impressive feat considering the boost to 1080p rendering. The Xbox One version mostly achieves the same solid 30fps performance at 900p, but there are times when the frame-rate is noticeably compromised, resulting in uneven motion and even the odd torn frame (too few in number to be noticeable). "Performance is a real issue on the Wii U version, operating at a significant deficit to the Xbox 360 and PS3 versions." The biggest issue with the Wii U version is its lacklustre performance level, the game visibly struggling even to match the inconsistent update of the Xbox 360 and PS3 versions of the game. The most obvious lapse in fluidity we noticed occurred during a mission set on Salt Island, where we were tasked with following a military officer through a sugar cane plantation. 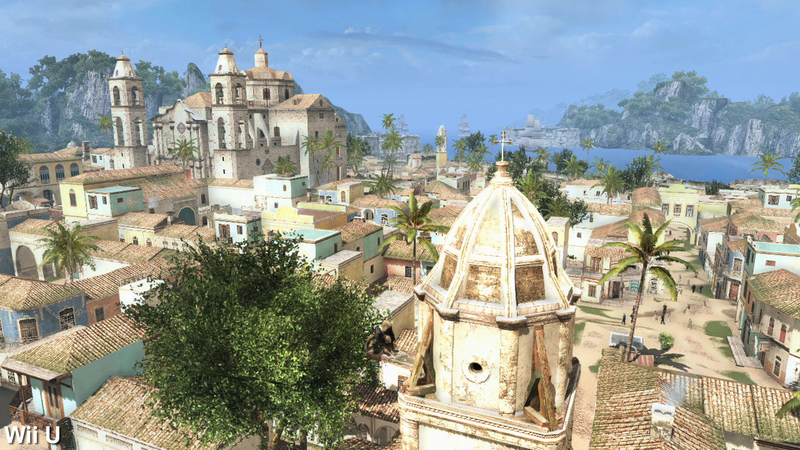 The surrounding environment is packed with the use of physics-enhanced dynamic foliage, which appears to be the mostly likely cause for the performance dip. We never experienced the problem during large naval battles where the screen would often be filled with volumetric alpha effects - something we felt sure would challenge the Xbox One's ESRAM set-up. 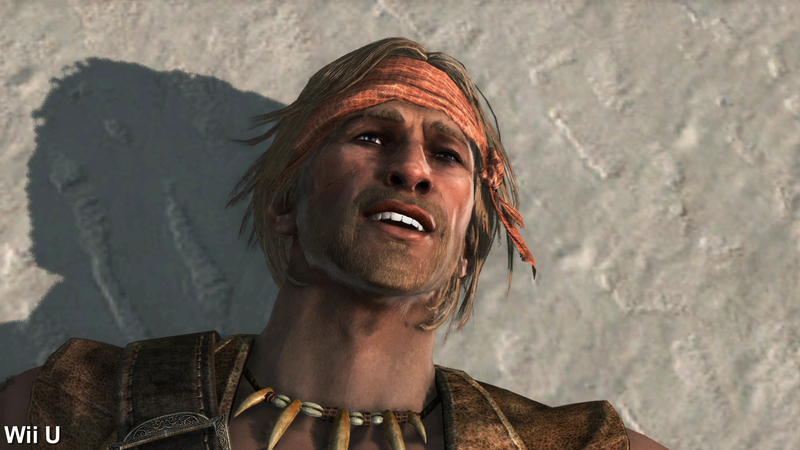 While we appreciate the PS4's locked 30fps update and the benefit that this brings in terms of consistency where gameplay and controller response is concerned, the ability to run Black Flag at 60fps is a tantalising prospect - and something that is only possible on PC, resulting in a smoother, far more fluid experience than on console. Achieving such high frame-rates at 1080p is achievable if you turn down a few of the more performance-sapping effects - opting for SSAO over HBAO+, turning off soft shadows, and lowering MSAA all help to make this possible without dialling down image quality below next-gen console levels. 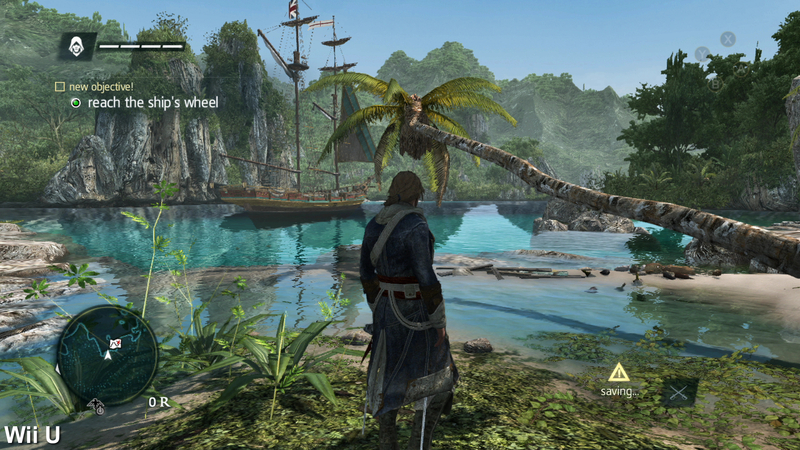 In addition, we did note reports that the multiplayer version of Assassin's Creed 4 was running at 60fps during this year's E3, apparently on PlayStation 4 hardware. We dipped into the online version of the final PS4 version and can report that the frame-rate is the exact same locked 30fps that we see in the single-player mode. 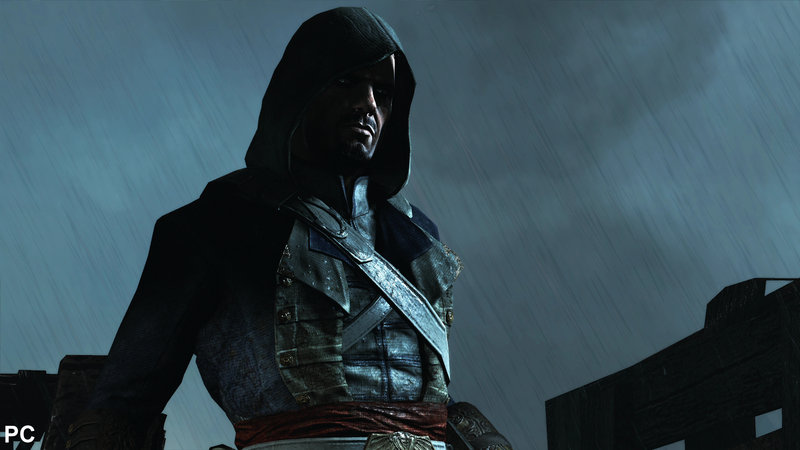 "The locked 30fps of the next-gen console versions might seem a bit disappointing on paper, but the absolute in the update and in controller response is a welcome addition to Assassin's Creed on console." It's a rock-solid 30fps on PlayStation 4 at 1080p, while the Xbox One maintains a similar performance level at its reduced 900p resolution, with just one or two little hiccups. 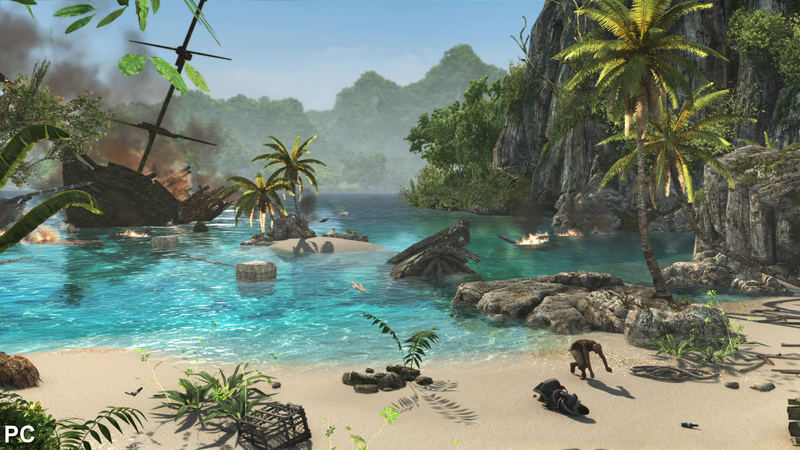 As a huge multi-platform release factoring in no less than six different formats, Assassin's Creed 4 is a remarkable achievement for Ubisoft, with the core experience replicated across all formats without any fundamental cutbacks outside of graphical changes and superficial downgrades. The ability to switch seamlessly between land and sea exploration is superbly handled, helping to make the entire expanse of islands and ocean feel like one coherent world where you are free to plunder and pillage at will. Coupled with beautiful visual design and the careful integration of real-life historical figures, Ubisoft has created one of the best titles in the franchise so far - the only tangible negative point being that some of the gameplay mechanics and mission structures come as across as dated and overly familiar. 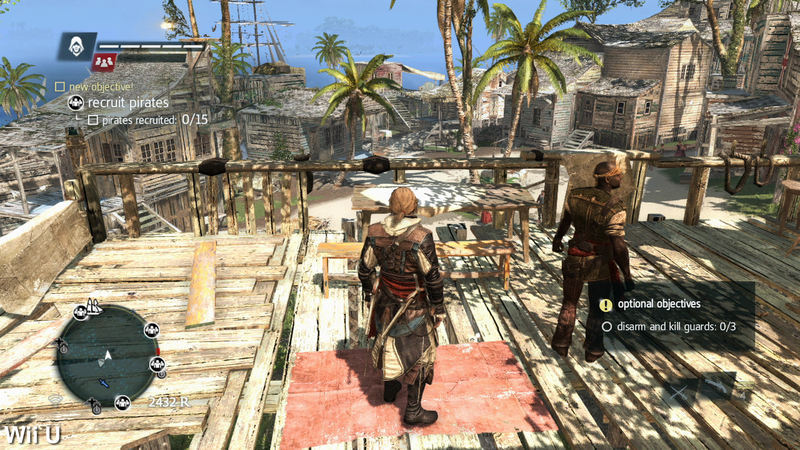 However, while AC4 is indeed feature-complete on PS3, Xbox 360 and Wii U, the highly variable frame-rates genuinely impact gameplay. 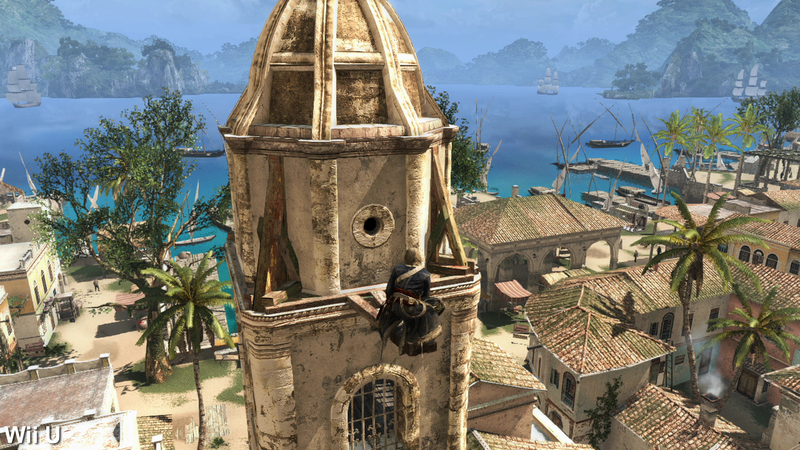 While the Assassin's Creed series has never really required a crisp controller response, the heavy drops in fluidity simply make it harder to quickly traverse the environment, particularly when chasing down targets. With performance so far behind every other version of the game, it's hard to recommend the Wii U game at all, despite its image quality matching PS3 and Xbox 360. With the next generation consoles we have the level of stability required to let the gameplay breathe without hardware limitations getting in the way. 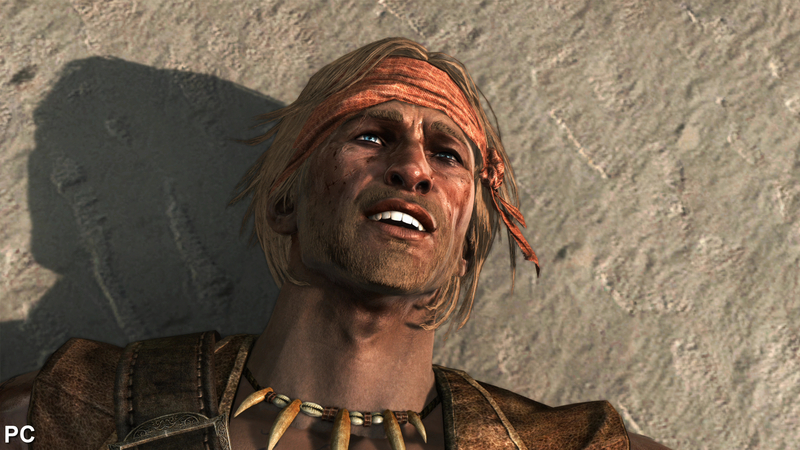 This is perfectly demonstrated on the PS4 after the release day patch has been installed: 1080p visuals allow the intricate artwork to shine, while the rock solid 30fps update means that control is never disrupted outside of the game's somewhat erratic animation blending system and automated climbing mechanics. The Xbox One version unfortunately has a harder time delivering the same accomplishments, due to the lower 900p resolution and sharpening filter giving the game a much rougher look. The appearance of frame-rate drops in some scenes is also disappointing, considering the 30fps target and sub-native visuals, but on the plus side these issues were a fairly rare occurrence during our capture session, outside of isolated experiences. 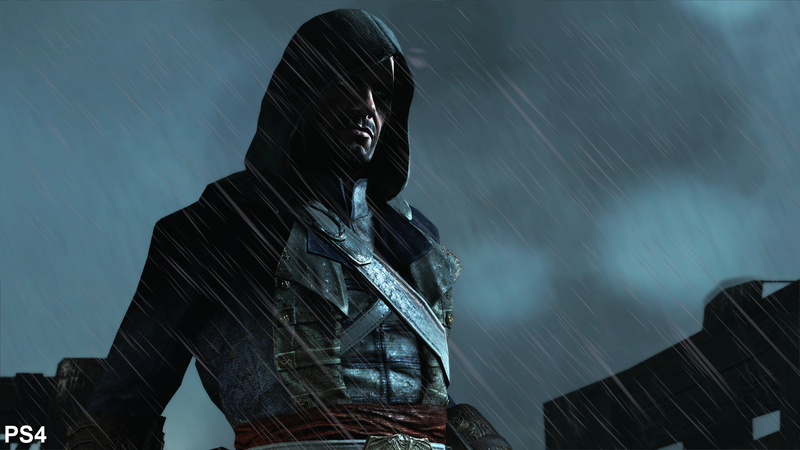 "The combination of 1080p visuals, rock-solid frame-rates and the return of Aveline via bonus download content makes the PS4 version our pick of the bunch." In terms of the console versions of the game, the PlayStation 4 version rises to the top - it offers the highest resolution and best overall image quality, plus - just like the PS3 game - you get an extra hour's worth of content featuring Aveline from the Vita title, Assassin's Creed 3: Liberation. 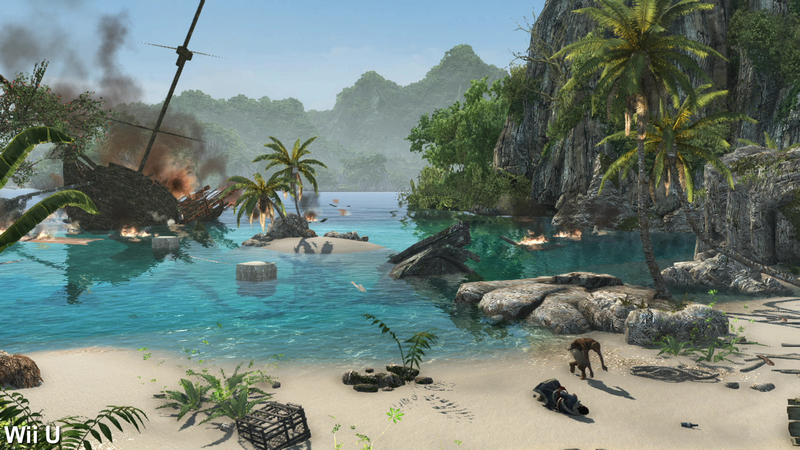 On that note it's clear that the PS4 game is the definitive release of Assassin's Creed 4 on the console formats. While the experience doesn't come close to defining next-gen gaming, the boost in hardware capability now makes it possible to enjoy Black Flag for all its flaws and accomplishments without anything else getting in the way - plus you get an hour's worth of exclusive content too, available only on PS3 and PS4. In that respect the PS4 game is worth coughing up extra for over the current gen releases, and if you already own the PS3 version then trading up to the PS4 edition for just £10 is a no-brainer. Despite its failings in image quality and some occasional drops in performance, the Xbox One version still delivers a worthy upgrade over the 360, PS3, and Wii U versions for owners of Microsoft's new console, although we hope that the unsightly sharpening filter can be disabled on system-wide level in a future update. That said, there is a more affordable choice available that offers all the visual refinement of the PS4 version - and more. If you have a decent gaming rig, the PC version is the way to go from a software price/performance perspective. Black Flag is available on PC for around £35 online, while you'll be looking at no less than £48 for the PS4 and Xbox One releases - a tidy saving of £13. Factoring in the ability to achieve a similar level of image quality to the PS4 game while running at double the frame-rate without needing Titan-level hardware, it's clear that PC's stranglehold on the top-end multi-platform experience isn't going to change any time soon. 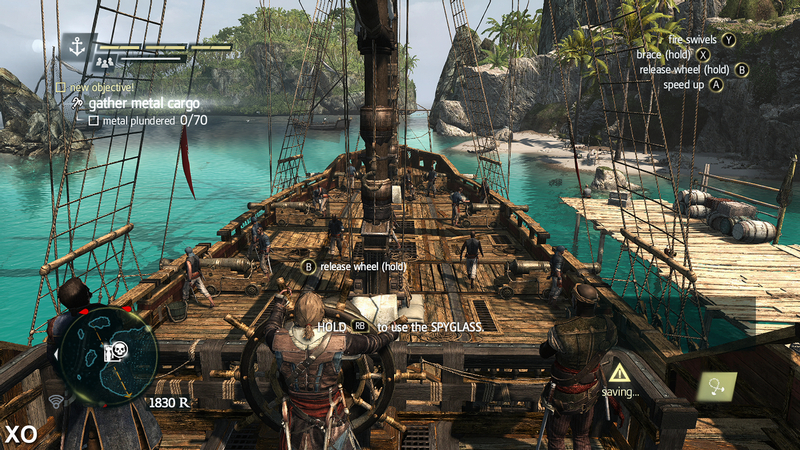 Whichever platform you end up playing the game on, you'll eventually face a series of Legendary ship fights. We've got a guide to beating every one of them.